I had forgotten how noisy 15 people in one room can be. It’s been quite a while since we needed to use every available dining room chair, plus bar stools and sofas, to seat a hungry crowd for dinner. And I was reminded, last week, just how much I’ve missed the happy chaos of musicians and piano, flute, violins and cellos. Sheridan first produced a chamber music festival here in Lewes in 2003, when he was just 19 years old. He invited his gifted fellow Curtis Institute students down to the shore to make music, and the festival was a big hit. Sher continued the festival until 2007, and that was basically it for years…years during which he became rather busy with teaching, performing, church music-directing and (oh yes) becoming a husband and father. So when he decided to present concerts again at the beach this month, I was overjoyed. There would be seven musician friends performing two concerts on successive evenings, in Rehoboth and Bethany Beach. They would arrive on Sunday night, rehearse for two afternoons and a dress rehearsal before Wednesday’s first concert. The rest of the time they would be relaxing by the water, and enjoying being together. Before the fact, I loved writing press releases once more (pretty easy to do when you are dealing with such stellar resumes), and we got a lot of pre-event “buzz.” It brought me back 13 years to the first music festival, and a flood of happy memories. Very soon, the gang arrived in Delaware, and very soon after that, it was showtime. “From Celtic to Classical” was a fun program of classical, Celtic and jazz pieces, influenced by folk music traditions. Both Sheridan and Ya-Jhu had original works performed. The instrumentalists’ joy in playing together was infectious. The capacity audiences were tremendously enthusiastic. There was the inevitable glitch: Jonah’s cello developed problems just before the Bethany concert, so there was a mad scramble to borrow a student viola—the best we could do on an hour’s notice. Everyone got a kick out of the gorgeous sounds he coaxed from that poor little instrument. There were the laugh-filled post-concert get togethers here at the condo, lasting late into the night. My full house is empty as I write this. The musicians have returned to California, to Connecticut, to New Hampshire and upstate New York. Sher, Yaj, Aiden, and Evan have gone home to Oreland. Julie is back in NYC. It’s just Steve and me here today, and I am a bit sad. But the concerts were recorded, and will be broadcast on the radio soon, so I will be able to relive those magical performances. Meanwhile, if I listen closely, I can hear echoes of Bartok, of Dvorak, of Celtic fiddling. In my mind these amazing young people are still in my living room, joking and laughing. I can’t wait for more concerts next summer, but for now, the full house I love so much, is here in my heart. 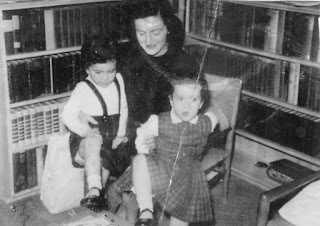 With Mom and sister Mo--bookish even then! I was a Catholic school girl. Diagramming sentences was hugely important in my English classes, and I just ate that stuff up. Spelling bees were my forté, and I played to win (even after I discovered that the “grand prize” was always a miraculous medal instead of, say, a sports car). As I grew older, I discovered that some of the people I loved the most were lousy spellers and so-so writers. It didn’t alter my feelings for them, of course, but I always harbored hope that they would start toting dictionaries and thesauruses (thesauri?) around, and step up their game a bit. My kids were raised largely in the Internet era, a time when the speed of their typing trumped their content every time. Abbreviations came into, and went out of, vogue quickly (though the obnoxious “LOL” remains quite popular. I recently read about an older lady who thought LOL meant “lots of love” and would write it next to messages of sympathy. “So sorry your Uncle Willy died! Laughing out loud!”) In school, diagramming and spelling bees are things of the past. Who needs ‘em now that there are spellcheck and autocorrect? The problem is, of course, that machines don’t always capture the meaning of what is being shared. When I am in the mood for an apoplectic fit, I love to peruse the comments section after articles posted online. When the comment is in ALL CAPS, I can predict with certainty that it will be a grammar catastrophe. And Lord help the soul who attempts to correct these errors! In a world where ignorance is bliss, any signs of intelligence are ridiculed by subsequent posters. So where do we go from here? Perhaps we could start by valuing our beautiful language more, and attempting to use it properly. Maybe we could place a bit less emphasis on “plain talking” (and writing), and more on eloquence. You don’t need a graduate degree to appreciate a well-written turn of phrase, but it would be great if our vocabularies could crack the kindergarten ceiling once in awhile. OK, soapbox time is over! I’m off to diagram a few sentences and do the New York Times crossword puzzle! With a pen! LOL! On TV promoting my books! Hope everything was spelled correctly!